Example: As we were under sail crossing the middle of the open Pacific this spring, thousands of miles from any land, in the dead of night we came across huge unmarked fishing factories drifting into our path. We hailed them repeatedly on VHF radio but they wouldn’t answer us. They weren’t on AIS (we wondered if they were fishing operations were illicit and they wanted to hide their identity). The mother ship had scores of smaller unlit fishing boats and nets extending outward from it. As they came within a half a mile of us, we shone our super-powerful strobe light at them, strobing the light and flicking it at their helm, and shown it on our sails also to highlight that we were a sailboat in their path. They didn’t respond verbally, but they did change their course and began to move away from us. Golden Glow Strobe Light 1. Fishing Pirates 0. Most Powerful Handheld Flashlight (Water Resistant but not submergable), 3500 Lumens, LED, Rechargeable. This baby packs a punch and is great for places like the Tuamotos when you’re returning by dinghy at night from a beach cookout and want to see coral heads a good way off in the water. 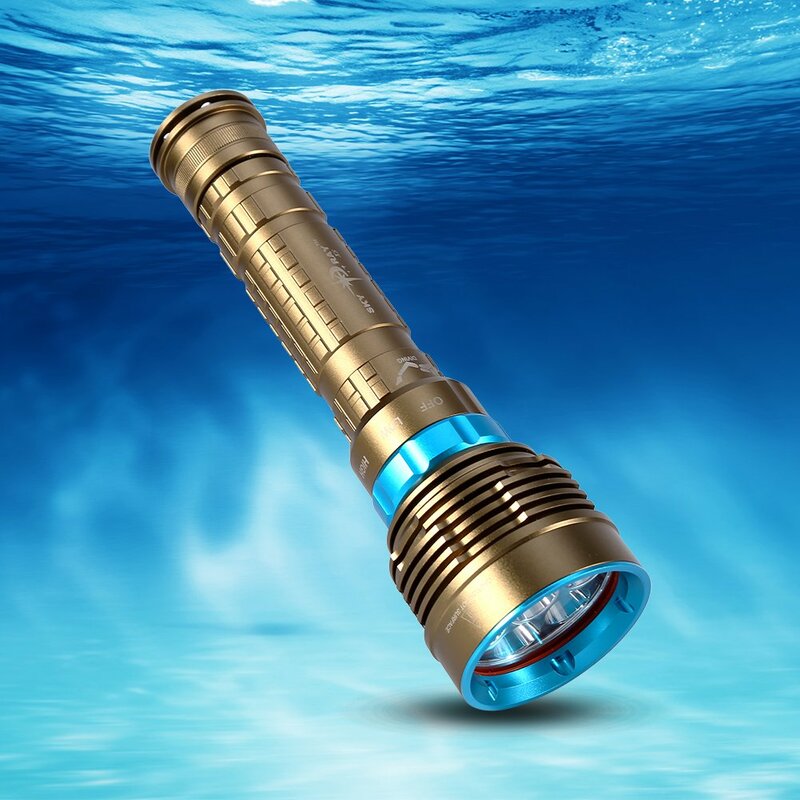 This diving flashlight has 18,000 lumens and goes down to 100 meters. http://amzn.to/2vLh4Ro There is no built-in handle, but it comes with a cord that has a slider to tighten it so it’s easy to secure around your wrist when you’re diving and have your hands full. 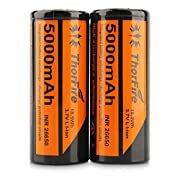 Batteries are not included unfortunately but we found some powerful, well-priced rechargeable batteries that work great (see below). Late 2018 update on price – ouch! 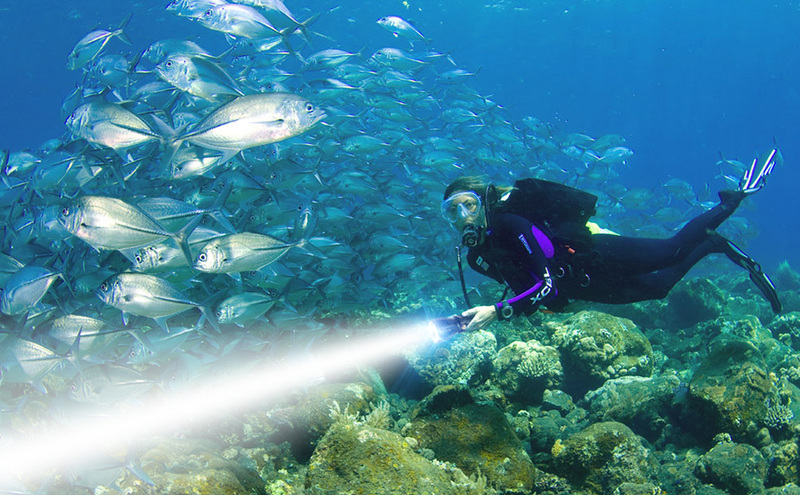 These diving flashlights have soared in price, no doubt due to the US trade wars with China. Let’s hope they return to reasonable prices soon. They are still wonderful, very useful lights, but I am dismayed that they now cost 3x what they did last year. When we’re on night passage or are working in a dark part of the boat, I practically live with my LED headlight on my forehead. Frankly, the soft strap is a great headband for keeping my hair out of my eyes. We began our sailing journey with regular headlamps and now exclusively use 12volt RECHARGEABLES. It is great to be able to simply charge them off our solar power during the day and use them at night. And we feel a lot better not adding more batteries to landfills. The best headlamp for sailing is one that has both white and red light options. 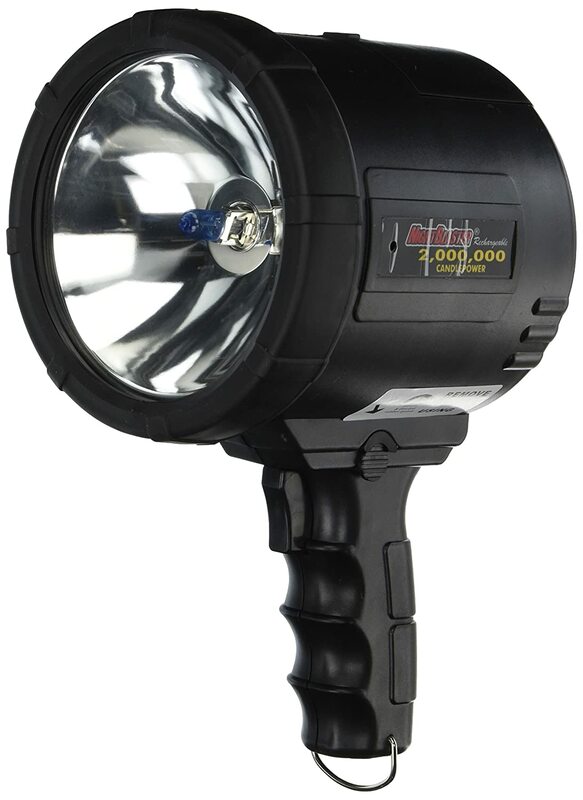 My favorite used to be a 220 watt $90 LED lenser light http://www.ledlenserusa.com/seo-7r-477.html#start=3, but I became wary after the second one broke. BEST CHOICE, BEST BUY: Now they make a very bright (500 lumens) comfortable, waterproof, rechargeable and cheap $15.99 headlamps https://amzn.to/2SZLxVs. Knock on wood – they’re going strong after several years of frequent use. Speaking of costs, try to get your headlamps and flashlights in the USA and either bring them or have a guest bring them to the boat. Wow is there a difference in price between online USA prices like Amazon and buying in a resort store or chandlery. We decided to do night diving for the first time in Bonaire and paid 3x the Amazon price for this relatively low-power scuba diving light in a dive shop on the island. Ouch! 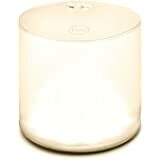 Honorable mention goes to our solar-charging, portable, lightweight, pretty light Luci Lights, one of our favorite friends on Golden Glow. 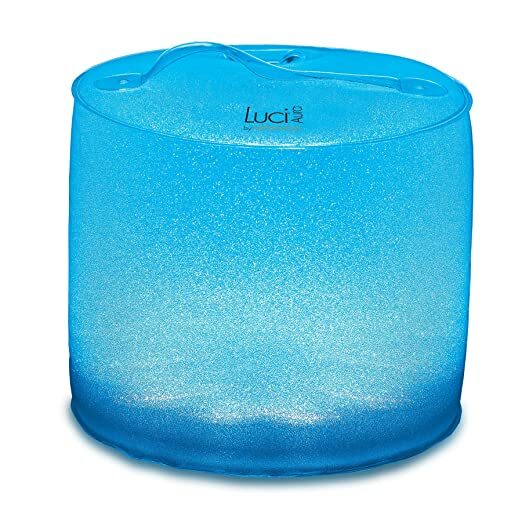 Every day we put our lucis on our dashboard in front of the window to charge, and every night we turn them on, gracing our outdoor dinners with their multi-gem-colored glow, lighting our acey-deucey and other games. They are so lightweight and malleable, I even like to read with one on my scrunched under my chin or on chest, aiming up at the pages but letting Rand sleep beside me without being bothered by the light. Do you have a direct link to those $15 rechargable headlamps? That link is broken.